The Cannedy Performing Arts Centre, a fixture in North Central area for more than 30 years, will become AZ Dance District on Oct. 1 with the sale of the business by Pam Cannedy and Stepan Oleksyn to Rendee and Lincoln Combs. Rendee has owned a successful dance studio in Goodyear for more than 20 years, but the Combs are now North Central Phoenix residents, where Lincoln grew up. Their daughter, Callee, 13, attends Arizona School for the Arts, and will be on the AZ Dance District Performance Team. Their son, Parker, 10, attends Madison Meadows. Lincoln currently has his law office in the Biltmore area. 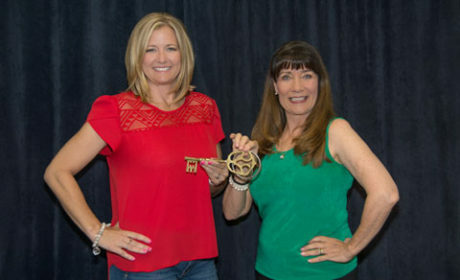 Pam Cannedy, right, co-owner of the Cannedy Performing Arts Centre in North Central Phoenix, ceremonially passes the key to the business to new owner Rendee Combs, who took over the studio space on Oct. 1 (photo by Mary Nelle Photography). Cannedy added that Combs is a “breath of fresh air with great energy” and will bring new and innovative ideas to the studio at 7th Street and Rose Lane. Cannedy and Oleksyn have made a second home in Prescott, where they are involved as choreographers for Prescott Center for the Arts, working on their fourth show this year. They have recently been hired by Yavapai College as choreographers for the school’s upcoming performances. The couple will be dedicating their newfound time to producing shows and performances for corporate and community events and fundraisers. For more information about the new AZ Dance District, call the studio office at 602-218-6175 or e-mail studio@AZdancedistrict.com.